Incident early this morning involving anti-fracking demonstrators, site staff and Police results in unprecedented use of force by Cuadrilla’s security team, after weeks of growing concerns over policing and security at anti-fracking protests. Activity took place on public highway – not Cuadrilla’s private land. 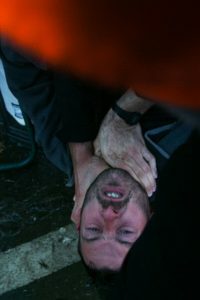 “Today’s brutality by Cuadrilla’s security team represents a totally disproportionate, violent and unnecessary response to the ongoing peaceful protests at Preston New Road. Particularly concerning were the actions of the Head of Security, who punched and throttled a man. “While security guards may be allowed to use ‘reasonable force’ to eject someone from private property; punching demonstrators in the face whilst pinning them to the ground on a public road amounts to assault. 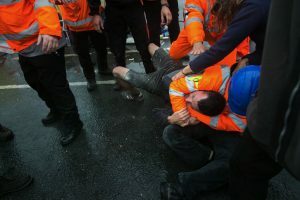 “This violent behaviour from Cuadrilla’s staff against community members and supporters cannot be left unchallenged – the Police must act to guarantee the safety and right to peaceful protest of all people present at Preston New Road. This morning’s incident came at the end of a 35+ hour blockade of the fracking site gate by local woman, Michelle Martin. Further – last night, as part of an attempt by Police to clear overnight protesters from the Preston New Road site, another man’s arm was broken as Police removed him from tower a structure. Growing protests by local community members have been taking place every day at Preston New Road in Lancashire since the start of 2017, slowing and often halting Cuadrilla’s work to prepare the site for drilling. Sustained opposition has caused months of delays, and millions of pounds of losses for Cuadrilla, and supply chain companies are cancelling their contracts. This week saw the launch of a month of action from local groups and Reclaim the Power to continue resisting Cuadrilla’s attempts to begin drilling.